We all know very well that the South Korean giant Samsung did not choose the Galaxy S or the Note for the triple camera, as the South Korean giant Samsung has already launched its first smartphone with the triple camera and side fingerprint. Yes, Samsung finally launched its first smartphone with triple camera and side fingerprint reader. The South Korean giant Samsung did not choose the Galaxy S or the Note for the triple camera, as the South Korean giant Samsung has already launched its first smartphone with the triple camera and side fingerprint, and the most interesting thing about this is that the South Korean giant Samsung choose its triple camera concept for its ‘A’ series smartphones. Yes, the South Korean giant Samsung launched the all-new Galaxy A7 (2018) with many striking features. The all-new Galaxy A7 (2018) takes chest in photography and integrates three sensors for the rear photography. 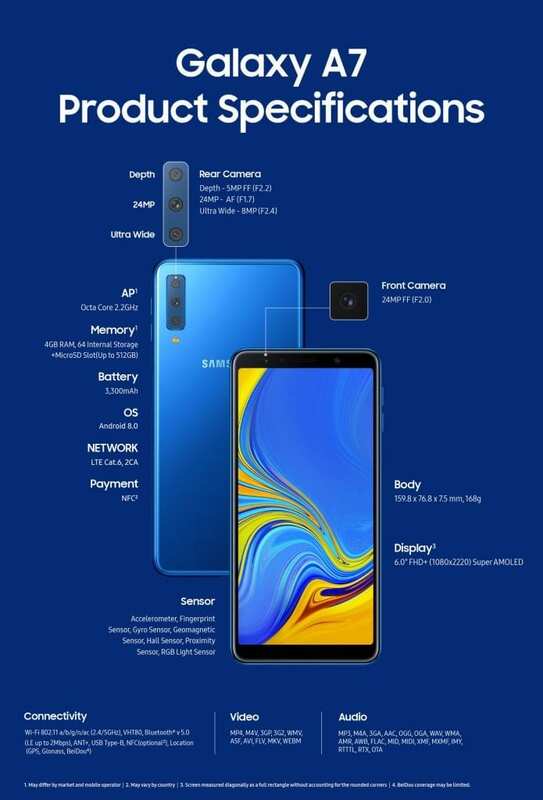 However, the fact is that this all-new Galaxy A7 (2018) comes with an unusual location in Samsung devices for the fingerprint reader until this year. The all-new Galaxy A7 (2018) has variants of 4 and 6 GB of RAM, with the possibility of having up to 128 GB of internal storage. At its heart, it integrates an eight-core processor, which with enough security will be a mid-range Exynos. With a 6-inch screen and FHD+ resolution (higher than the A7 of 2017), it is somewhat larger than its predecessor, but it has a smaller capacity battery: 3300 mAh (compared to 3600 mAh). Although one of the most striking changes is that the fingerprint reader in the side shows the style of Sony and Razer Phone, as we saw in the Galaxy J6+. What is the bet of this new A7 in terms of cameras? We found a triplet formed by a lens of 24 megapixels with aperture f/1.7, another 8-megapixel wide-angle aperture f/2.4 and a third 5-megapixel 120-degree angle and aperture f/2.2. Part of this triad is focused on improving the portrait mode that is so fashionable in current time. Specifically, they are the 5 megapixel and the main lens (the 24 megapixels), which also pulls pixel binning and combines four pixels in one to achieve a better result in low light. For another lens, the 120, Samsung promises a realistic result by assuming the same angle of vision as the human eye. And for all this is the support of artificial intelligence, providing intelligent detection of scenes. For its part, the front camera promises a good result even in low light, including also the bokeh effect for selfies. Of course, the Emojis ARs are available. The South Korean giant Samsung has told us about these points, in fact, the only thing that the brand has communicated at the moment is that it will be available in some European and Asian markets in the near future. 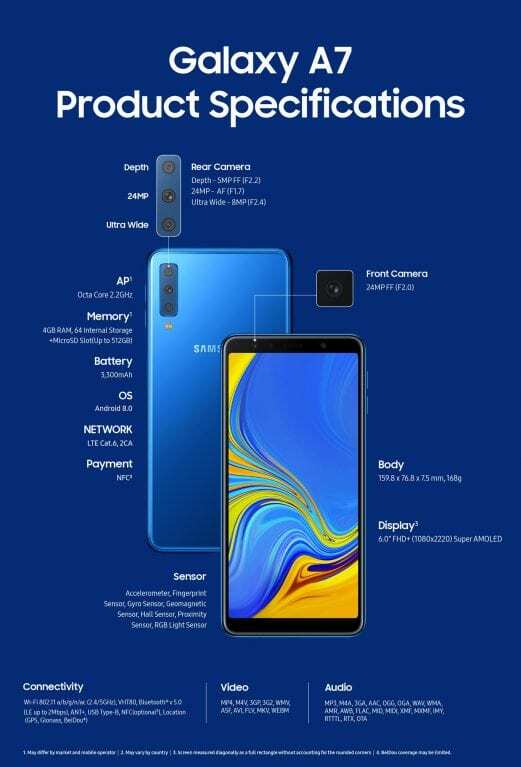 Thus, according to the market, there will be some versions or others of the ones we have seen before in terms of RAM and internal storage, as well as the presence of NFC. As we have said, there will be versions of 4 GB/64 GB with microSD, 4 GB/128 GB (without MicroSD) and 6 GB/128 GB (without microSD).